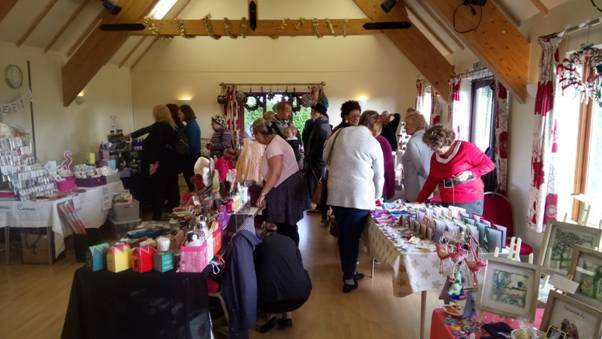 Thank you to everyone who came to our Christmas Fayre on Saturday (17th November). We made fabulous proceeds of £426 which we split equally between Alzheimer’s Research UK and village hall funds. There were 14 tables of excellent merchandise and there was a lovely atmosphere throughout the day. It’s hoped that we can make it an annual event at Abbots Morton. (Below): some of the buyers mingling at the Christmas Fayre. Thank you to everyone who came to our TEA for TINNITUS drop-in on Saturday (29th September). More than 50 people joined us for a cup of tea, coffee, cake and brunch of bacon and Lashford sausage sandwiches. Together with a fabulous tombola and a raffle we were able to raise £260 for the British Tinnitus Association. The village hall funds also benefited by £260. Our particular thanks to all those who generously helped with donations… to Hillers Farm Shop and Restaurant; to Waitrose, Alcester; and Tesco, Blackpole. It is estimated that 1 in 10 people suffer from Tinnitus which can range from ringing in the ears to whistling, buzzing and crackling or endless variations of sounds in the head. The British Tinnitus Association funds research and gives advice to those who suffer.